Business requires specialized knowledge. But, sometimes giving knowledge can be a business of its own. The Goddard School franchise opportunities are a great example of this. This franchise for sale offers a unique investment opportunity with unlimited potential for generations of children to come. Great parents want to ensure the best for their kids. It is no wonder why education has always been a top priority. Surely, so for the millions of other parents out there, a child’s education means intellectual development, future opportunity and prosperity overall. If you want your kids to have fun while learning something new, then let them learn from some of the best. The Goddard School franchise has been doing that for more than two decades now. Being a part of an education franchise would surely be a healthy way to develop our future. With their innovative F.L.E.X Learning Program, the Goddard Schools have set the standard for pre-elementary and holistic education, incorporating expertise and scientific methods to ensure that kids are in the safest hands. Their strong approach is apparent from their accreditation and affiliations. 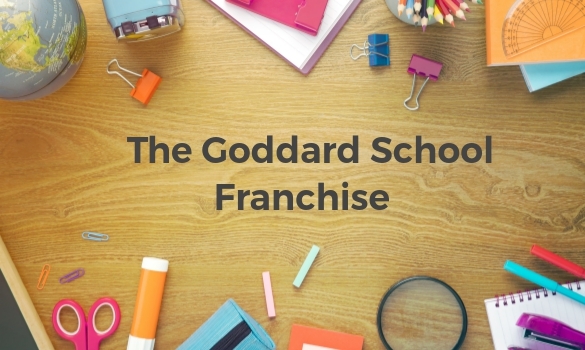 With their view to expand, you can surely incorporate your business acumen and zeal to serve the community by investing in your own franchise by The Goddard Schools. With a little over $800,000, you can start your own Goddard School franchise and be a part of a team that aims to serve kids, ensuring an average EBITDA of $273,406. If run properly, the franchise owner could earn all this while having family time, enjoying hobbies and even investing in other business opportunities. Of course, this is all possible because of the support provided to each franchise owner by the company. The Goddard School provides franchise owners with plenty of support to ensure their individual success. This education franchise provides help with every aspect of business, from construction all the way through to education and operational support. They also offer marketing, finance and IT support to franchisors needing an extra bit of help. You will never have to worry about anything with The Goddard School franchise. You will always have guidance available to you in case you hit a rough spot. This is an incredible advantage unique only to certain franchise investments, so you may want to take advantage of it. Just in case you are still unsure, here are some helpful facts. The Goddard School grew from its humble origins in Pennsylvania to be the leader in the childcare franchise segment in the US. They have a strong commitment for “doing well by doing good” which you can surely imagine the prospects it brings with the association. And, not to mention, they offer the brand value that is a premium highlight for investing on its own. With an incentive to serve the society and build a strong future for the kids, The Goddard School franchise opportunity is quite attractive. Furthermore, a place where kids can be comfortable and confident to learn is undoubtedly a promising franchise venture. It is up to you if this is the right business for you. The Goddard School franchise opportunities are available for high income or densely populated areas. Rather than just dividing franchise territory by location, The Goddard School places restrictions based on population. Therefore, you could receive competition from other franchises. However, you are promised a fair share of opportunity to win customers from your area. This creates a competitive environment if you would like to buy a Goddard School franchise in your local area.